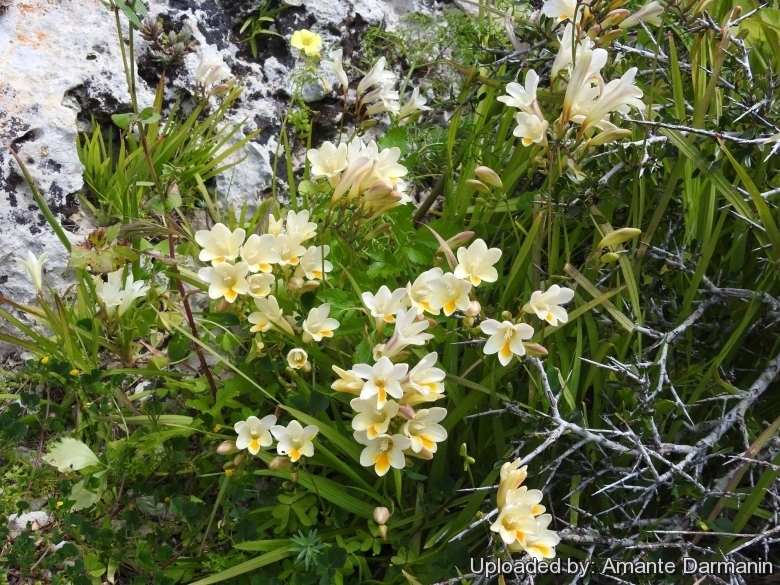 Origin and Habitat: The common freesia (Freesia refracta) was originally found in southern Africa , but is now distributed in many parts of the world. 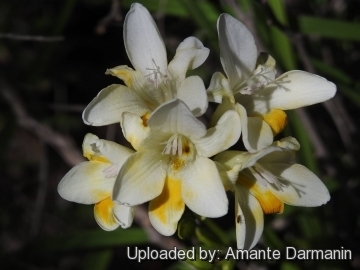 Description: The common freesia (Freesia refracta) is an herbaceous ornamental flowering plant, erect about 18-45 cm tall, arising from a bulb-like ovoid reticulated corm. 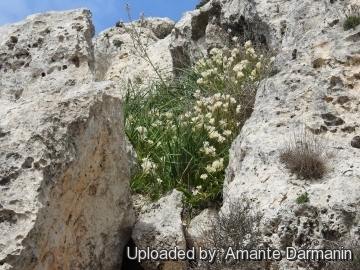 The plant has weak stems and about 6 linear slender leaves. The stem is more or less branched bearing a few reduced leaves. During the flowering season, the plant produces long spike inflorescences with flowers orderly arrayed along one side of the inflorescence. The flowers are yellow or greenish yellow and start to bloom in succession from the base to top of the inflorescence, and produce a very pleasant fragrance. The complex scent carries the deep tones of jasmine, a touch of citrus, and coriander. There is also an elusive violet fragrance, although its presence is fleeting and disappears once the flowers are cut. A patch in bloom fills much of the garden and cut flowers perfume an entire room. Spathe valves are oblong, lanceolate not covering the ovary. Flower tube is abruptly constricted. The limbs are labiate with unequal segments. Freesia quickly became a hothouse favorite when it was introduced to Europe from South Africa. It continues to be one of the most popular cut flower. The original type is no longer in cultivation. Derivation of specific name: In 1890 Prof. M. Foster gave some bulbs to an English gardener, Gumbleton, who describes the flowers as small, yellowish in colour, and bent backward on the stem, hence the name refracta. Corm: Bulb-like, c. 1,5 × 1 cm ovoid to conical, with thick, pallid, reticulated, fibrous tunics. Basal bulbils few. Roots: A normal plant has two types of roots: the thick contractile roots function mainly to support the plant, whereas the numerous thin roots transport materials from the soil to the plant . Stem: Terete, flexuose, distantly branched, with a few much-reduced leaves. Leaves: Basal leaves about 5-7, linear or linear-lanceolate, firm in texture, up to 45(50) cm long (often surpassing the stem), and 6-15 mm broad. Green with a prominent central nerve. Flowers: Very fragrant, arranged in horizontal or decumbent lax secund spikes with a flexuose, zigzagging rachis, each bearing (3)5-10(12) flowers. Spathe-valves 5-8 (12) mm long, oblong to obovate, obtuse or subtruncate, not hiding the ovary, green when young, membranous when maturing. The flowers are 25-40 (50) mm long. Perianth mostly pale yellowish-green to bright yellow, but also , orange-yellow, whitish, green or purple, with orange spots in the inferior tepals and purple veins in the throat. Tube 16-25 mm long, c 12 mm in diameter at the throat, constricted suddenly below the middle; limb distinctly bilabiate, its segments (tepals) are unequal ,ovate-oblong, 10-15 mm long, 8-12 mm wide, those of both the two lips much imbricated, the central one of the upper lip broader and more obtuse than the side ones; they are slightly mucronate and sometimes cuculent, erect-patent in the fully-expanded flower. The flower possesses three stamens inserted at the base funnel shaped tube and an inferior ovary with three carpels. Anthers lanceolate, just exserted from the perianth-tube, much shorter than the filiform filaments.Filaments 10-14 mm; Anthers 5-7 mm, linear. Cultivation and Propagation: Freesia refracta is one of the most commonly produced cut – flower species among bulbous, tuberous and rhizomous ornamental plants. 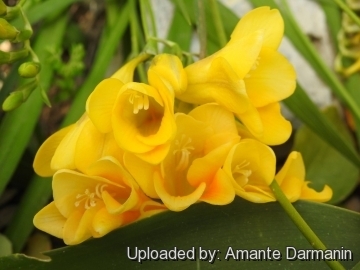 Large-scale cultivation of freesia plants for commercial purposes has been carried out in many countries. 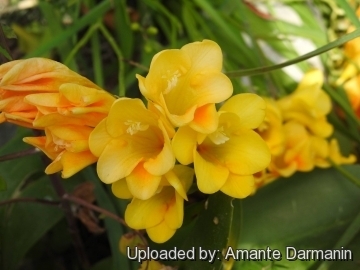 Propagation: Freesia refracta can be propagated either sexually through seeds or vegetatively through corms. The seeds of freesia are difficult to obtain, and it usually takes years for seeds to develop into mature plants. Therefore, corms are practically used to propagate plants.